Slightly edited version of an article originally published under the title "Coherence and Incoherence about the Iran Deal." Three positions have emerged regarding the Joint Comprehensive Plan of Action (JCPOA). One is fully coherent, one is only partially so, and one is fully incoherent. By coherent I mean that they rest on a careful reading of the Iran deal as it actually is—not as people may imagine it to be—and then reach a conclusion to support or oppose their position. The third position is incoherent because it rests on a misreading of the Iran deal and then reaches conclusions based on that misreading. Position one, that of opposition to the deal, rests on the belief that it will not prevent Iran from acquiring nuclear weapons and that this failure will probably occur much sooner than the fifteen years when the announced inspection regime ends. Those who take this position (of whom I am one) regard the possession of nuclear weapons by the Islamic Republic of Iran to be an unmitigated disaster for reasons many of us have presented. Opposition to the JCPOA rests on the belief that it will not prevent Iran from acquiring nuclear weapons. It is a coherent position because it connects a proper reading of the text of the agreement to logical conclusions. Simply put, we oppose the deal because it fails to accomplish the goal of blocking Iran's path to the bomb. We do not believe that an Iran with the bomb will moderate its views or that the process of attempted Détente and engagement will alter the core objectives of the Islamic Republic, one of which remains the destruction of the state of Israel. Position two is partially coherent but is far less publicly expressed, though it probably has support in the governments of Britain, France, Germany, Russia and China, as well as the United States. Holders of position two concur that the agreement will not prevent it from acquiring nuclear weapons in fifteen years at the latest but probably much sooner due to Iranian cheating and the refusal or inability of the P5 + 1 countries, especially the United States, to snap back economic sanctions or launch an attack that would destroy Iran's nuclear program from the air. The JCPOA makes sense only if one assumes that containment and deterrence of a nuclear Iran is a viable outcome. Position two reflects the "realist" views conveyed by some nuclear strategists, according to which the sheer possession of nuclear weapons will bring about a modicum of rationality in Tehran, one that departs from the theologically inspired apocalyptic ideology for which the Islamic Republic has become world famous. As a result, according to this view, the nuclear deterrents of Israel and the United States can contain and deter an Iran armed with nuclear weapons, just as the United States succeeded in containing and deterring previous nuclear powers such as the Soviet Union, Mao's China, and even "crazy" North Korea. Advocates of position two see Iran as a far more normal country than do those of us who take its ideological views more seriously as a guide to its policies both before and after it would have the bomb. The virtue of this largely unspoken "position two" is its honesty about the JCPOA. If pushed, its advocates may very well acknowledge that the agreement is full of loopholes that undermine the kind of inspection regime needed to prevent Iran from getting the bomb. The problem, however, is that advocates of position two do not believe that an Iran with a nuclear bomb represents an existential threat to Israel or anyone else because they believe it can be contained and deterred as previous nuclear powers have been. As Michael Doran has argued, some also think that that a détente with this Iranian regime is possible, and therefore that the loopholes in the agreement are not a cause of concern. Therein lies the partial incoherence of this position. Since advocates of this position believe that Iran will emerge as a regime as rational as previous nuclear powers, they favor a policy of containment and deterrence over one of renewal of economic sanctions or a military attack with its unforeseen consequences. Already in 2012, Wolfgang Ischinger, the former German Ambassador to the United States, now director of the important Munich Security Conference, wrote publicly in favor of containment and deterrence of a nuclear Iran in the flagship German paper the Frankfurter Allgemeine Zeitung. While I do not agree with Ischinger, a highly respected figure in the Western foreign policy establishment, his article had the merit of saying in public what many officials probably said behind closed doors. The JCPOA makes good sense if one takes the view that a system of containment and deterrence of a "rational" nuclear Iran is a viable outcome. Most supporters of the Iran deal claim that it will prevent Iran from acquiring nuclear weapons. The third — fully incoherent — position supports the Iran deal in the peculiar expectation that it will prevent Iran from acquiring nuclear weapons. 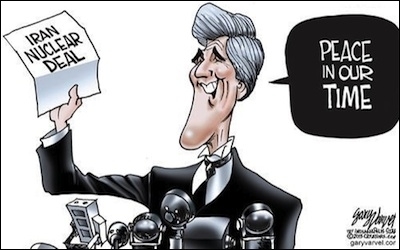 This is the stance taken by President Obama, Secretary of State Kerry and the other leading supporters of the Iran deal. They were recently joined with enthusiasm by Brent Scowcroft ,a former National Security in the first Bush administration, and somewhat more tepidly by Kenneth Pollack, a policy analyst at the liberal Brookings Institution. Despite their divergent political allegiances, their recent statements in support of the deal share one thing in common: neither addresses in print the details of the Iran deal that undermine the likelihood that it will block Iran's path to the bomb. Both assume what has yet to be demonstrated, namely that the agreement is designed in a way that will achieve its stated purposes. This position is incoherent because, as I and others have argued, it is not possible to read the text of the deal and reach the conclusion that it blocks Iran's path to the bomb for fifteen years. At best, the deal puts it off for fifteen years, but, as I have demonstrated in this blog, and as Senator Robert Menendez, Senator Charles Schumer, and Mark Dubowitz of the Foundation of Defense of Democracies and others have pointed out in detail, the deal's inspection measures are not adequate to prevent Iranian violations. Further as I have contended, the deal fosters the growth of a variety of interests that will undermine its own enforcement. Those opposed to enforcement will include not only Russia, China and Iran, but also very likely our European allies who signed the deal — Britain, France and Germany. The JCPOA's inspection measures are not adequate to prevent Iranian violations. Key elements of the deal explicitly conflict with the goal of blocking Iran's path to the bomb. 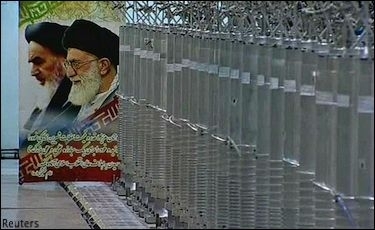 These elements include the now-famous 24-day delay; the additional 50 days of potential delays that can take place when disputes occur; plans for a research center in Fordow, modernization of the nuclear plant in Arak, and the transfer of knowledge that both will likely foster; permission for Iran to build new centrifuges in eight years; refusal to allow inspections of military institutions; the rapid lifting of economic sanctions that will create huge economic interests (not only in Iran but on the part of foreign businesses) in non-enforcement of the deal; and the concession that there be no limits on Iran's ballistic missile program in the deal. Even some of those who express criticisms of the deal suggest that it will accomplish its goals for fifteen years. In this morning's Washington Post, Dennis Ross, who worked on Iran issues on both the Obama and Bush administrations, and General David Petraeus, who commanded US and other coalition forces in Iraq and Afghanistan and was director of the CIA from September 2011 to November 2012, called for clearer signals that "if Iran dashes toward a weapon, especially after year 15, that it will trigger use of force." Yet they too write that "the deal would block the uranium enrichment, plutonium separation and covert paths to a nuclear bomb for the next 15 years." It is hard to understand why these two astute observers express confidence that the deal will delay Iran's acquisition of the bomb for fifteen years. They too do not address the critics of the deal who point out ways in which Iran could circumvent its restrictions much sooner than fifteen years. President Obama may privately accept the inevitability of Iran getting the bomb, believing a nuclear Iran can be contained. If the President truly supports position three, as all of his public statements indicate, then he has embraced a fully incoherent stance. But perhaps the President and those among European and US foreign policy decision makers who support the deal understand full well that the JCPOA does pave the way to an Iranian bomb but have concluded that this outcome is preferable either to an intensification of economic sanctions or to a US military strike and its unforeseeable consequences — a position they are not willing to state publicly. If this is the case, then there is a further incoherence in the President's position, namely supporting a deal that will in reality pave Iran's path to the bomb while insisting in public that it will do just the opposite. If the President has embraced position two—the one that accepts the inevitability of Iran getting the bomb but maintains that it can be contained—the Iran deal becomes, for President Obama, another version of the policy of hope and change. It rests on a hope that the deal with this Iranian government will lead it to change and become a normal state that has left its ideological passions behind and that therefore can be deterred as previous nuclear weapons-possessing states have been. If the President can overcome Congressional opposition and the agreement comes into effect, the government of the Islamic Republic of Iran will surely point to those elements of the text that can be used to effectively prevent its enforcement and will likely do so much sooner than fifteen years from now.